Two of the area’s four senior football clubs have had their games postponed today (Saturday). Little Common’s scheduled visit from Worthing United and Bexhill United’s trip to Oakwood in Macron Store Sussex County Football League Division Two have been called-off due to waterlogged pitches. Hastings United’s game at Chipstead in Ryman Football League Division One South, however, and Westfield’s match away to Seaford Town in Sussex Division Two are both set to go ahead. The reserve team derby between Westfield and Little Common is also on (kick-off 2pm), as is Bexhill’s second team clash at home to Southwick (kick-off 3pm). 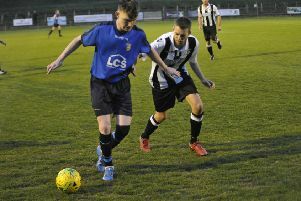 A number of Macron East Sussex Football League encounters have succumbed to the rain of Thursday night and Friday morning, but quite a few are set to go ahead. Ryman League, Division 1 South: Chipstead v Hastings Utd. Macron Store Sussex County League, Division 2: Little Common P Worthing Utd P; Oakwood P Bexhill Utd P; Seaford Town v Westfield. Reserve Section (East): Bexhill Utd v Southwick; Westfield v Little Common. Macron East Sussex League, Premier Division: Hollington Utd P Robertsbridge Utd P; Iden P Battle Baptists P; Ninfield Utd v Sedlescombe Rangers; Peche Hill Select v Ore Athletic; St Leonards Social v Rock-a-Nore. Division 1: Bexhill AAC P Wadhurst Utd P (Wadhurst unable to raise side); Hawkhurst Utd v Sidley Utd; Little Chelsea v Hollington Utd II; Sandhurst v Mountfield Utd. Division 2: Catsfield v Eastbourne Rangers; Crowhurst P Wittersham P; Herstmonceux P JC Tackleway P.
Division 3: Bexhill-On-Sea P Herstmonceux II P; Eastbourne Athletic P Peche Hill Select II P.
Division 4: Bexhill Utd III v Little Common III; Peasmarsh Utd v Bexhill Rovers; St Leonards Social II v Westfield III. Division 5: Sedlescombe Rangers II P AFC St Leonards P; Ticehurst II P Mayfield P; Wittersham II P Parkfield P.
Division 6: Hampden Park Utd v Sedlescombe Rangers III; Icklesham Casuals II P Sandhurst II P; Orington v Punnetts Town II. Little Marabou Challenge Cup quarter-final (1.30): AFC Hastings v Hooe Sports. Hastings & District FA Junior Cup, 2nd round (1.30): Battle Baptists II P Ticehurst P; Pebsham Sibex P Ninfield Utd II P.
Hastings & District FA Lower Divisions Cup, 2nd round (1.30): Bexhill AAC II v West Hill Utd; Burwash v Hawkhurst Utd II; Robertsbridge Utd II P FC Westridge P; JC Tackleway II P Battle Baptists III P.
Ryman U21 League, South Division: Worthing v Hastings Utd.